The kitchen area was built around the concept of different surfaces working together: stainless steel countertops for work, white Corian for preparation, and solid white oak for storage. A landscape painting by Chabauty's grandfather hangs above the sink, adding a note of serenity to the room. The kitchen contains a Viking range and oven, a Bosch 800 Plus Series dishwasher, a KWC Eve faucet, a Liebherr HRB 1100 refrigerator. Artek A110 Pendants hang above the dining table, a custom oak piece surrounded by chairs from HAY. A close-up of the steel counter shows the Artemide Miconos lamp hanging near the sink, as well as the diffused light that streams in via a set of skylights arranged throughout the roof. An example of a space with good bones, the original shop floor provided the designers with a blank canvas. Chabauty chose a black door on the outside of the structure to maintain the original, unassuming exterior. It can still throw off guests who aren't sure what to expect when they walk inside. "People still think it's a business or an office," he says. "They're always surprised." While the building's pedigree sounded a little rough around the edges—an abandoned 1950s commercial building in Montreal's quickly changing Mile-Ex neighborhood—architects and designers Jean-Guy Chabauty and Chris Barrie felt they found a structure with grit—and renonvation potential. 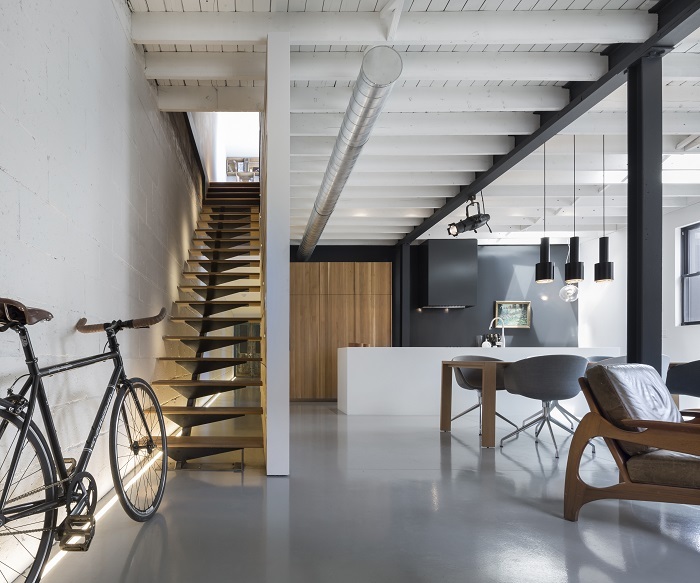 With their Le 205 project, the partners in Atelier Moderno made a minimalist intervention to an industrial castoff, rehabbing the space with a rich material palate and custom furniture while keeping the industrial backbone of the brick structure intact. The pair talked us through the transformation, initially used as an office but now a home for Chabauty and his family.